I first read this book years ago (and that review is already logged) but I had loaned the book to someone who decided he needed it worse than I. Eventually I obtained another copy and finally had reason to read it again. Ryrie first published the book in 1969 and it went through five printings by 1973. Balance may have been the right word for the times, but I read it looking for better discussion on how believers walk with God. I was not disappointed. Often I have found that good men who wrote on a subject before certain controversies developed give a better explanation than those contemporaries. His section on Lordship Salvation is still very good, long before the current controversy. Ryrie “balanced” the idea of spirituality between a legalism on one hand and a license on the other–a common way to present it, but an older and better way to do it. Our spiritual walk, says Ryrie, is our spiritual walk, i.e., we do not “let go and let God” do it all for us, but neither do we rely only on ourselves. “Again the human and divine are joined in the matter of walking in the Spirit (Gal. 5:16).” When asked if there is a secret to walking with God he responds, “Is there a ‘secret’ for victory in this area? Yes, there is, and it is no secret!” And Ryrie closes the book with, “This is the road to spiritual life–a dedicated life that is disciplined, dependent and developing. This is the ‘secret’ of spiritual success; and yet it is no secret, being plainly revealed in God’s Word.” Charles Ryrie was one of my favorite writers. I would still place this book at or near the top for someone seeking to have a closer walk with God. “All men have a conscience (Rom. 2:15) and it can be a right guide (John 8:9). 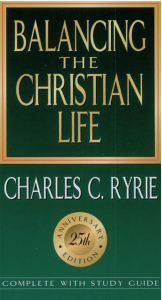 It may also only seem to be right when actually it is leading the person down the wrong road (Acts 23:1).” Charles Ryrie, Balancing the Christian Life, p. 42.